Ahh Gingerbread. The sweet and spicy smell of these baking just feels like Christmas. 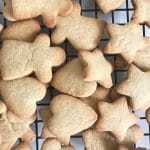 And if you love gingerbread I know you will love my latest recipe Simple and Easy Low Sugar Gingerbread Cookies. Gingerbread has been the topic of much conversation in the Goodie household. It all started a few weeks ago after Mr 7 acted the Gingerbread Man story out in class. He then coerced us into acting this out at home, much to the twin’s delight, my sheepish participation (in my defence I was a great cow) and to Mr Goodie’s refusal to participate. The twins are also very interested in all things Gingerbread too. They have been reading folk tales at daycare and one of the books they read was the Gingerbread Man. As a follow up activity they made gingerbread at daycare. Side note: I just LOVE how they do baking at daycare! 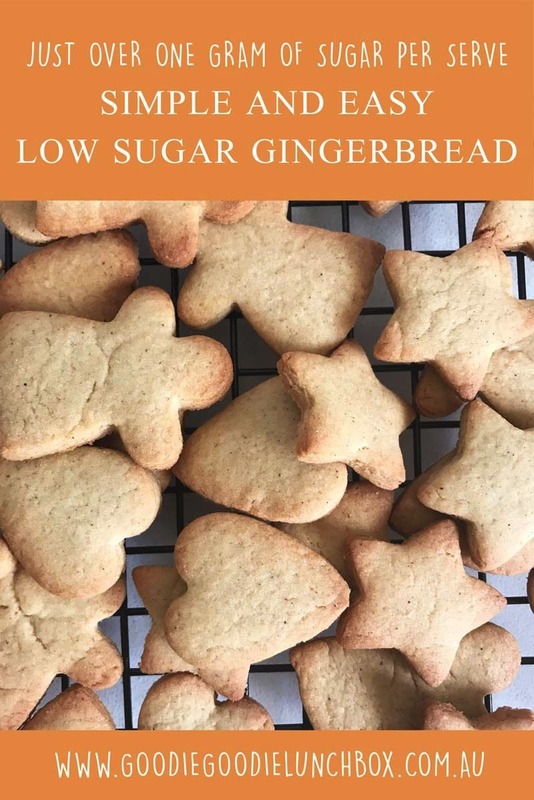 And because it’s the season for Christmas cookies we are baking these Simple and Easy Low Sugar Gingerbread Cookies at home too. A quick google search will show there are literally hundreds of recipes for Gingerbread. So why should you make these ones? 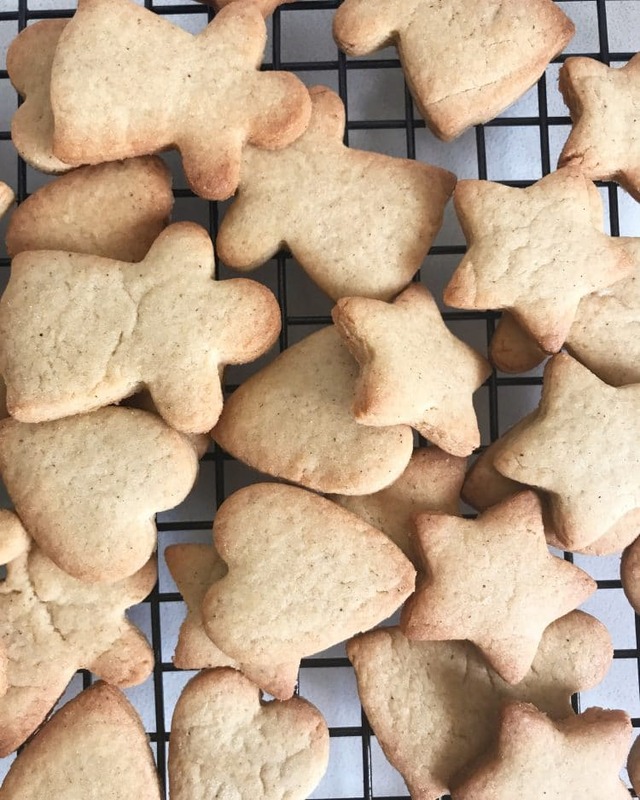 Well, for one thing these Simple and Easy Low Sugar Gingerbread Cookies are lower in sugar than traditional recipes. They only contain 1/3 cup of brown sugar in total which is just over 1 gram per serve. But don’t let the low sugar fool you into low flavour they are still sweet enough and have that flavourful trademark spicy festive taste. These Simple and Easy Low Sugar Gingerbread Cookies can also be frozen too. After baking, cool the cookies on a wire baking rack and then store in the freezer. These gingerbread cookies are perfect to bake now and freeze for Christmas parties or gifting later in the month. Another reason you should make my gingerbread is the recipe is that they are really easy! 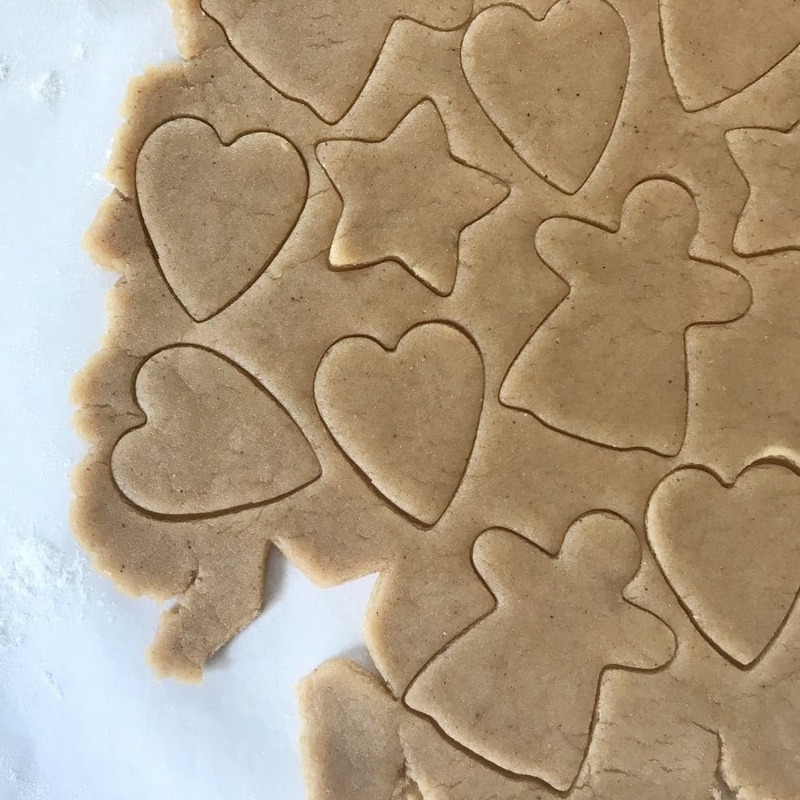 These Simple and Easy Low Sugar Gingerbread Cookies are a one bowl, 7 ingredient recipe that comes together relatively quickly (except the chill time). Which is what you want when you have little helpers. 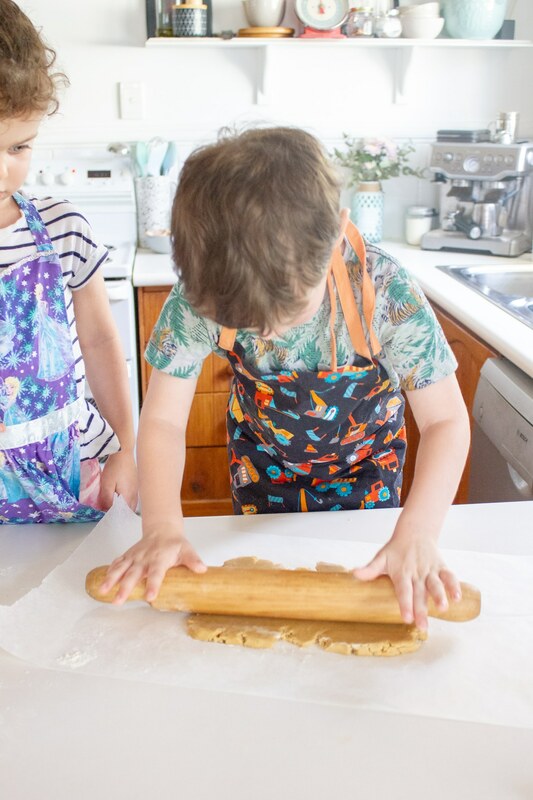 Do you bake with your kids? It’s something that we enjoy to do, and a bit of planning and preparation makes the process so much more enjoyable and much less…yell-y. So my biggest tip for baking with kids is to get everything you need out and ready and then invite your kids to join you to bake. And they will love baking (and eating) these. Looking for healthier baking this Christmas? Why not try my delicious Low Sugar Festive Spiced Cookies or my Healthy Chocolate Brownies? 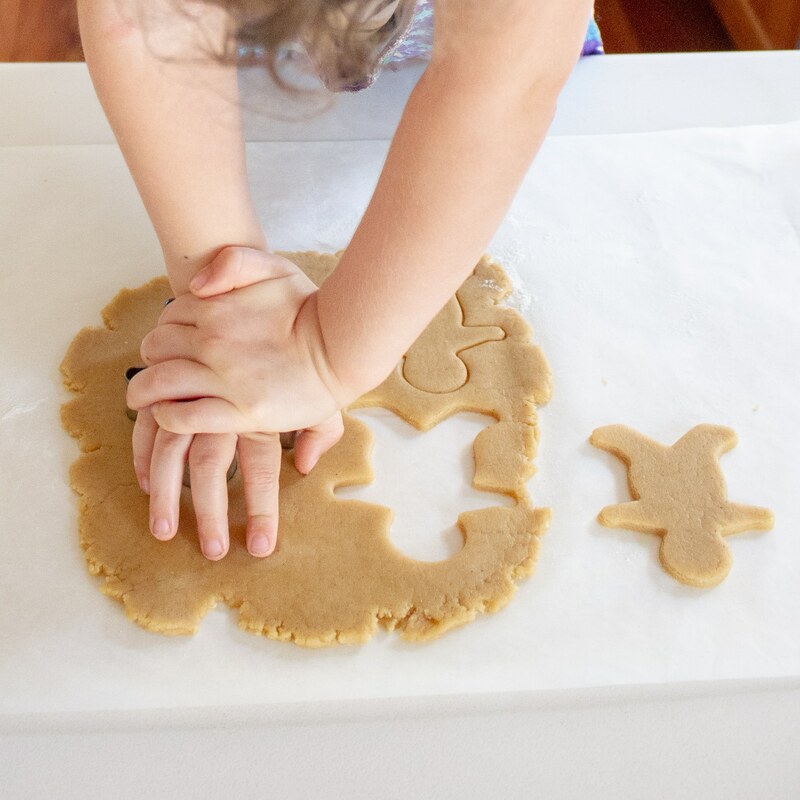 These Simple and Easy Low Sugar Gingerbread Cookies are great to bake with kids. Just over 1 gram of sugar per serve but retaining their sweet and spicy festive taste you will love this healthier version of the traditional favourite. Cool on a wire baking rack before enjoying or freezing for later. If you don’t like an overly gingery Gingerbread only add 1 1/2 tsp of ginger. This batch makes 100 mini gingerbread or around 3 dozen medium gingerbread men. The nutritional information is based on the mini cookie serving size. The medium gingerbread men have 3% of the average daily sugar requirement per cookie. These cookies can be frozen for around 3 months. Store in a ziplock bag after baking when they have cooled completely. I hope that you enjoy these Simple and Easy Low Sugar Gingerbread Cookies. If you bake them I would love to see your pictures! Share them with me over on Facebook or on Instagram. These are fabulous cookies Bernadette! They are awesome for this time of year. I love how you have the kids in the kitchen with you for this recipe, great work!! Cute! My kids would adore these! Not sure what I did wronged but didn’t make nearly as much as recipe says it should. Made about 12 cookies with normal cutters. Looks and smells yum though.